Tori Schickel looks for an open move during a game this season. 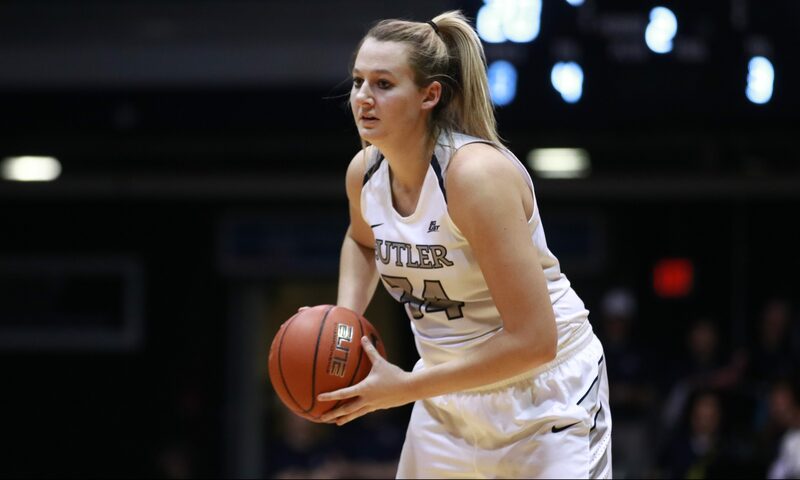 Schickel and the Bulldogs will face Northeastern in the first round of the WNIT on March 21. Jimmy Lafakis/Collegian file photo. The Butler women’s basketball team has accepted an invitation to the Women’s National Invitation Tournament. The Bulldogs will host Northeastern on March 21st at 7 p.m. at Hinkle Fieldhouse in the first round. It will be the Bulldogs’ first appearance in a postseason tournament since the 2013-14 season, when they faced South Dakota State in the WNIT. Butler won 20 games this season for the first time since the 2010-11 campaign, going 21-9 and finishing third in the Big East with a 11-7 conference record. With the Big East’s top teams, Marquette and DePaul, making the NCAA Tournament, the Bulldogs received the conference’s automatic bid for the WNIT. If Butler advances, it will face the winner of the first round matchup between Kent State and Green Bay.